I realise (2017) that I began dancing on stage (2000) to taste taking up space without hindrance. At the time, I was dancing because someone had noticed me and unlike the later noticing (2004) that made my body freeze and my insides hurry to fold in on themselves cell by cell, this noticing involved making spaces that I could flesh out for and with myself. 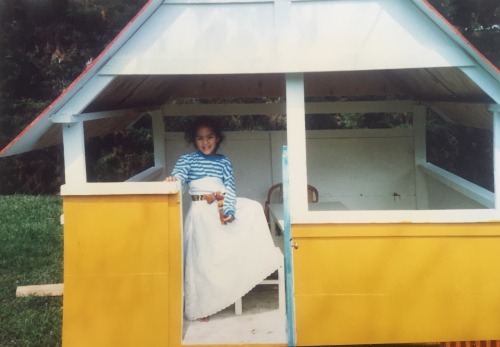 A small play house (1992) was also a space I held for myself. It was made from the crates used to transport my parent’s furniture from London to Nairobi (this detail emerged August 2017), and I would sit, and twirl and play within it. A hinged blue door gave me the permission to decide who could enter and who could not. I discovered (2000) that there were many spaces I was able to take up when dancing. My inner world and my body’s surface were mine and although I hadn’t learnt yet that others might question my right over these physical, psychological and body spaces, I think I was on the brink of seeing a future where these things would be revealed and have their impacts. My senses must have been on the edge of transitioning because from then on, dancing and tasting its freedom was something I actively sought out; spurred on (at first unconsciously and then consciously) by the complex environment of white supremacist patriarchy that was insisting I was not free. I understand freedom as a loaded, impossible space and refrained from using it or uselessly pursuing it (2014 onwards). Instead, I choose the spaces and relief and expansion of undoing. There is joy in this and there is toughness. (Circa 1993) These spaces wouldn’t always be free but right now, I feel them as such and take a leap. A leap made up of fearlessness. A moment caught in time. Caught in my leap into soft soft grass. My rubber knees, 6 years old and bouncy, would land me. Spongy like a young cat. And the rain that bought with it these bugs I have forgotten the name of. Swarms of them all over the kitchen floor, writhing lost, shiny-brown and wet. They’d be cooked and eaten. 2011. I wrote about moving to London in 1994. I didn’t know this was a rupture but later realise that I experienced it as such. 2017. Would I know this freedom again? I ask myself as I look at these photos (early 1990s). 1993 I run headstrong into a swimming pool thinking that I can swim and have to be fished out with a large net by a thin, wiry and strong man. The water slops around on the stone pale brown-yellow tiles. Coming out of the water, my hair long and wet down my back without the later memory (1998) that would associate the same sensation of wet hair down my back with numbness. I guess I was ‘free’ from time because time hadn’t really happened yet. Time had been supportively rolling on (1991) rather than forcing sharp changes in direction (2015). 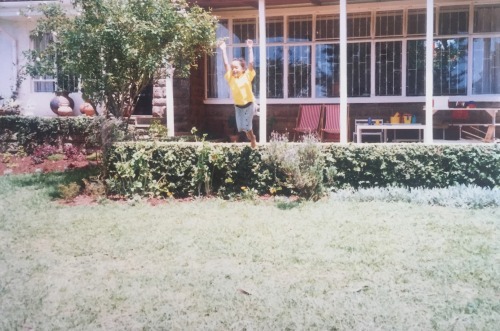 So I leapt (1993) off the veranda covered with green foliage; ivy vines claiming ownership over the brickwork. Languidly roaming and depositing their sticky roots as they saw fit… I moved up, propelled myself forward and for a moment, I hung in the air – my arms outstretched above my head, the front of my body soft, relaxed, in place, enjoying the air moving past me as it needed to. I imagine (2017) that I leapt seeing the ground but not knowing what would happen within the moments of suspension. 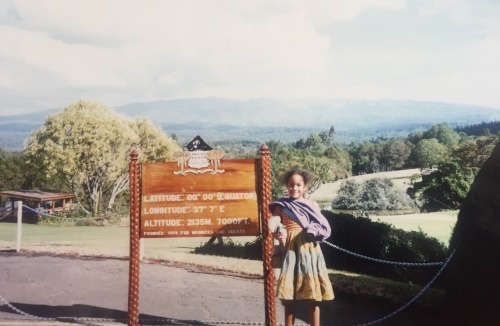 I was at the equator (1992) with a jumper wrapped around my arm that I would press to my lips for comfort (1989-1994). Cotton still feels good (2017). In the photo at the equator, there is a view behind me of greenery meeting sky. The space is endless for me. Green, luscious, endless prickly hedges. Soft grass hooked into dry earth. The photos catch me (1992) rather than me catching them with a pose (2000). Trying to control my image. Unshakeable nostalgia at these images that speak of home and displacement. Emotions with roots that I cannot remember or place (2017). These are images where I am leaning in to the lens, unafraid of being caught and trapped. Self-consciousness has yet to filter down into my bones like a mildly corrosive substance that leaves me brittle. My eyes engage rather than turn away downwards (2008, 2011, 2015, 2015 again, 2016). A friend tells me I look free when I dance (2017).